Ciao lovelies! 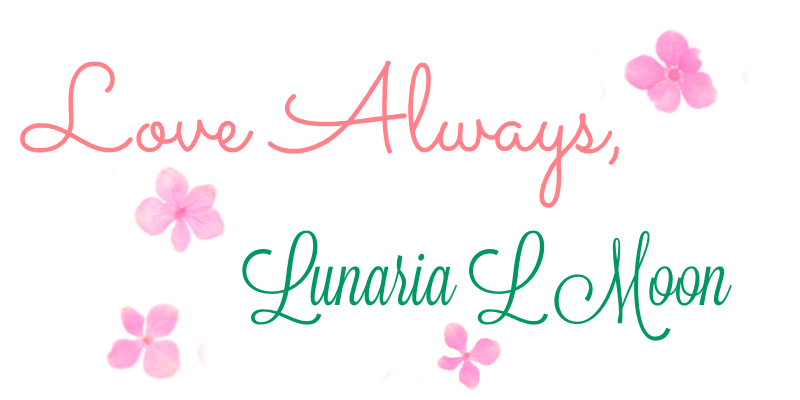 Today for Kawaii Friday I have a very extensive review post for you all! If you were ever thinking of buying from Blippo Kawaii shop and weren’t sure about it, this is the post for you! 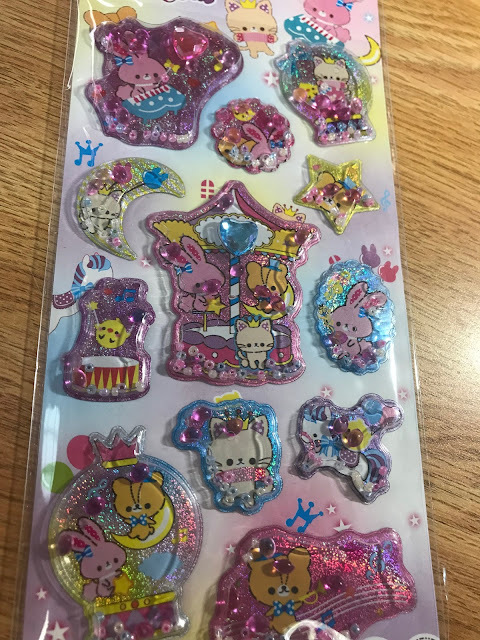 Today I’ll be reviewing not only the shop itself but 9 unique items from it, including 3 sets of stickers, a stationary set, a bead set, a mini-bag, a pill box, rings, and socks! 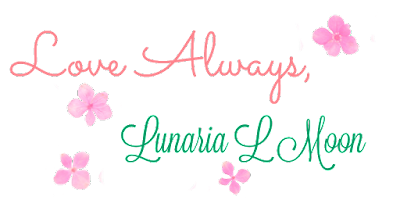 So, if you love kawaii stuff, deals, and reviews, stick around! The main reason I found Blippo Kawaii shop was pretty simple- I wanted to find a place to buy kawaii stationary and other goods that wasn’t ridiculously expensive. 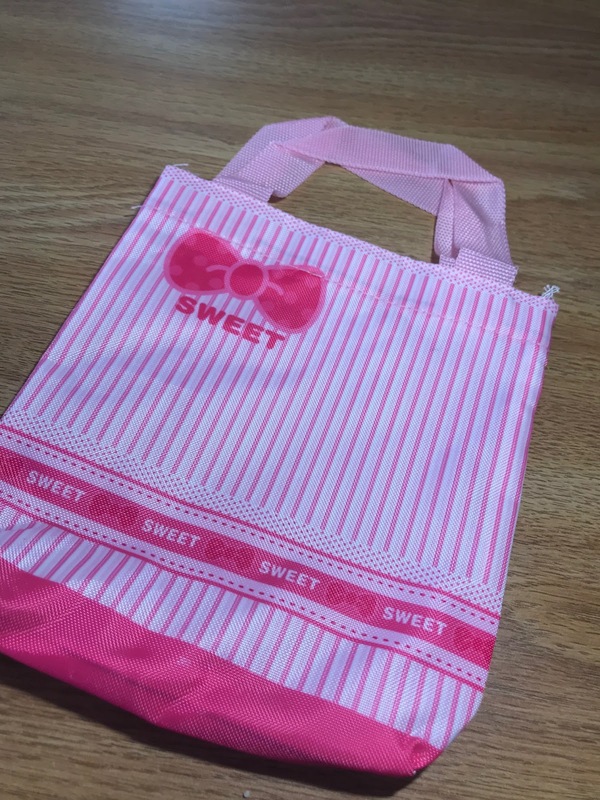 If you love kawaii stuff you might know that it’s hard to find kawaii items that aren’t expensive. 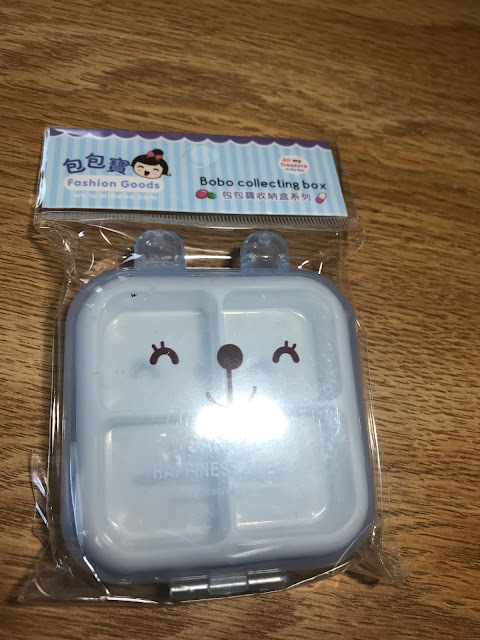 I usually turn to Aliexpress for things like this, but I wanted to find a place where I could get everything from one shop, and it would all come in one package. So first, I’ll review each item that I got, and then I will review the overall shop. Let’s get into the reviews! These are totally adorable, and BONUS- They’re candy scented! 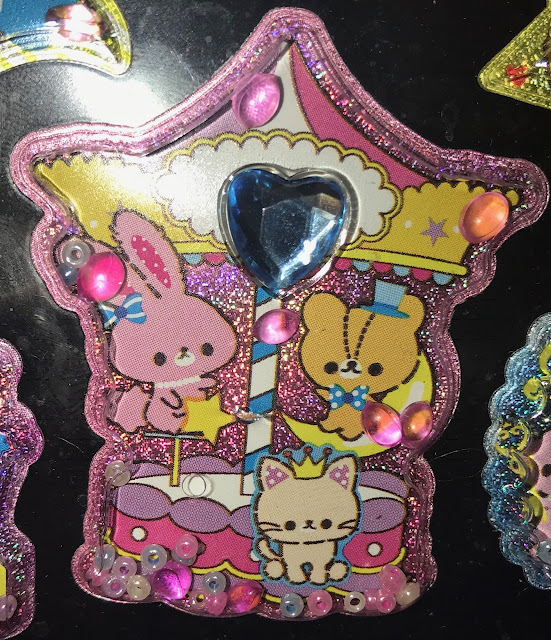 These stickers have a sparkly backing and they’re 3-D with tiny beads inside. On two of the designs, there is a rhinestone heart. The designs feature various kawaii animals and have various shapes. My favorite design is the Merry-Go-Round (Carousel). The price of these stickers was $1.33 (on sale) and I DEFINTELY think they were worth it. Overall: I rate these stickers on aesthetic and scent and overall cuteness: 5/5! These are cute but not really the highest quality. 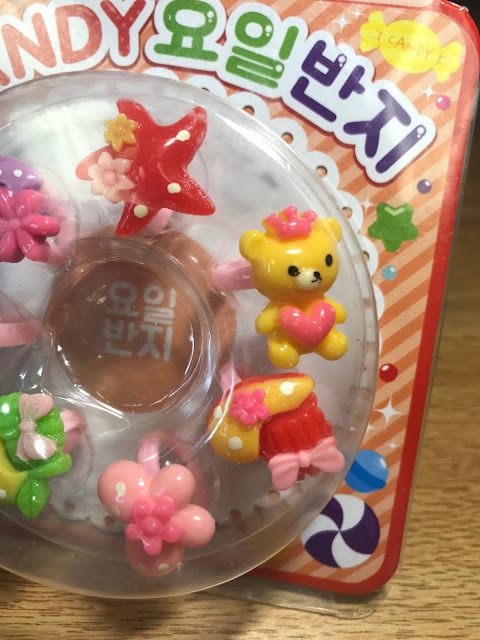 The rings are super tiny and don’t even fit on my pinky, they definitely would work better for children, but then I would worry about a choking hazard. I think I will just use the charms off the rings for deco-den or other crafts. I think the charms by themselves in terms of Blippo’s stock are worth it because you can’t buy a set of 10 charms for any cheaper than this ring set’s price of $1 (as of 1/31/19). I wasn’t really impressed with this item, overall. The quality seems very cheap, but I guess you get what you pay for, and at least the charms are cute. Overall I rate these rings – 3/5! This is so adorable, I can’t get over how super cute this little animal pill case is. This pill case was $1.65 and I believe that it is well worth it. I love the design of it, and it seems like it shuts nice and securely so your pills or other tiny items won’t fall out. I will either use it for a pill box or for maybe storing earrings or other small jewelry? I haven’t decided. Overall, I really love this item and I would buy it again in a heartbeat. 5/5! 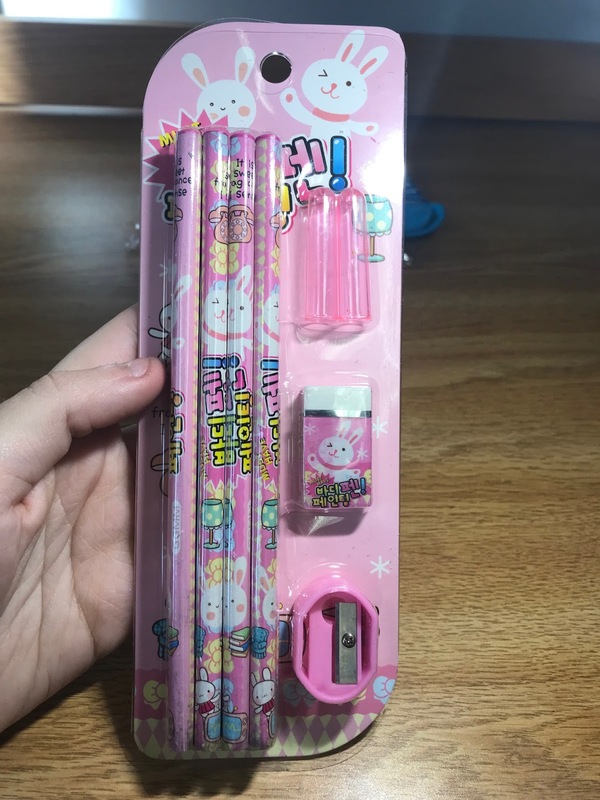 So this set comes with 8 pencils, an eraser, pencil sharpener, and two pencil caps. The design of this set is very cute, the pencils and eraser have a little bunny design on them. I tested the sharpener with one of the pencils and it works well. The pencils also write well, and the eraser works as well. I don’t have much to say about this one other than: I will be using this so much in the future. I really love the design and think this set is so cute and worth the $1.55 I paid for it. Overall, I think this set is adorable and I would give it a 5/5! These socks are so precious. They feature (what looks like) a hamster in a sailor scout looking outfit! How cute! The heart on the sailor uniform is stitched with some sparkly thread, but when I wore the socks, they didn’t feel scratchy. They were very comfortable and soft. 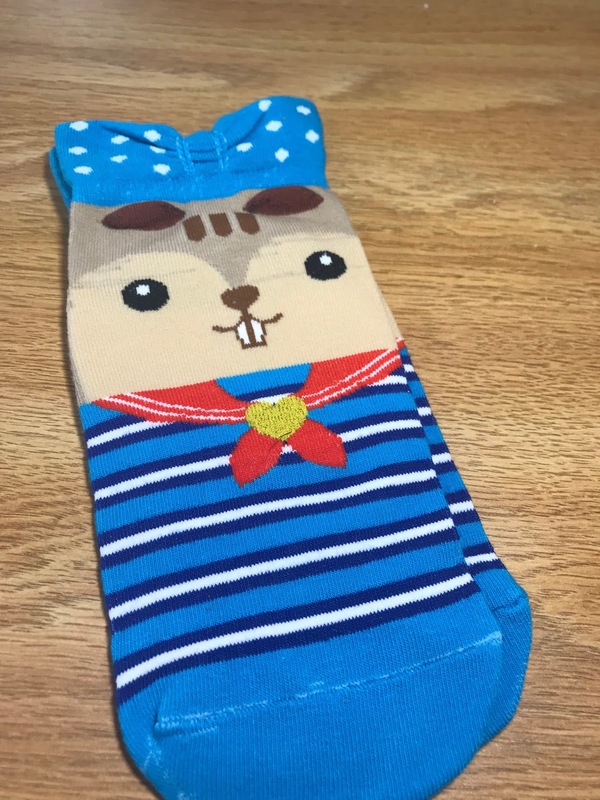 I think that I would absolutely buy these socks again, especially because they were only $1! Overall, I love these socks and have no complaints- 5/5! 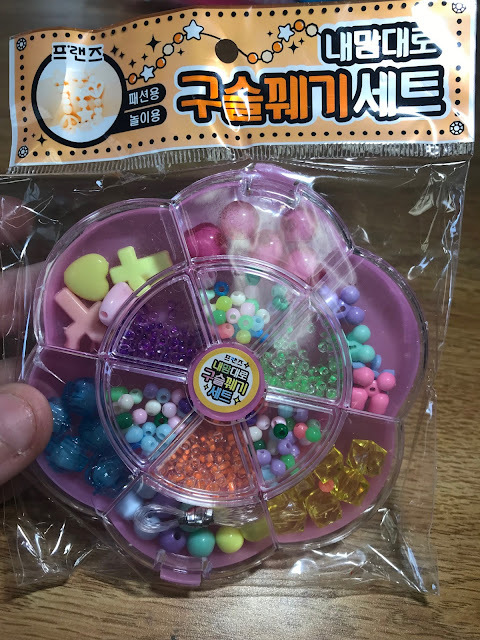 This set was decent in my opinion, it includes a variety of cute little beads, unfortunately I feel as though most of the beads in this set you could probably find in an American dollar store. But, the price was only $1.75, and they do come in a cute flower case which could be reused. It also came with a small amount of clear elastic cord. But yes, I feel as though the price on sale ($1.75) was accurate as the beads in this set seem cheap. I also would not let a younger child play with this set as the beads could be a choking hazard. (Though I think that holds true for most beading sets!). Overall, I wasn’t highly impressed with this item, but I think the low price and flower bead holder makes this item worth it. 4/5! What can I say except: I love these! These are so adorable. This sticker sheet features various cute bow designs in puffy sticker form. As far as I can tell, no bow design is repeated so this sheet features a TON of different designs of bows. 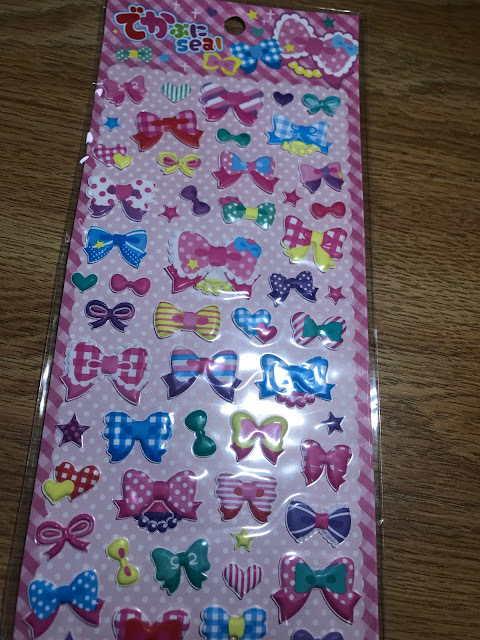 I want to put these stickers on everything but also want to save them in their package….decisions, decisions. Overall, I adore these stickers and would buy them again, especially at their list price of $0.90! 5/5! Overall I think this is very worth the $1 I paid for it. 5/5! 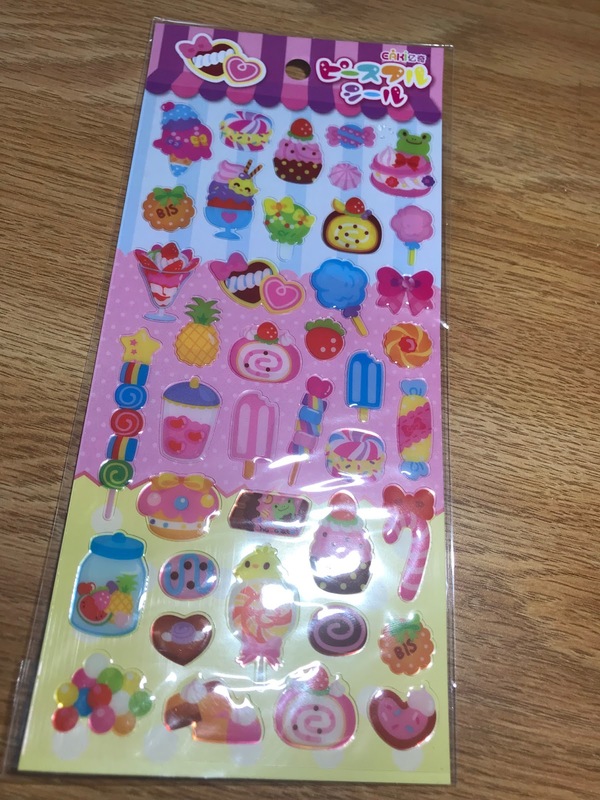 These super cute stickers feature various dessert designs. Designs include but are not limited to: cake rolls, biscuit-cookies, macarons, cotton candy, popsicles….. Each design is very adorable. These stickers were $1.26. I think they were well worth the price. Overall, I like these stickers and would buy more in the future. 5/5! When they say “1-3 weeks no tracking” for free shipping to the US, they MEAN 1-3 weeks and absolutely NO tracking. I thought it would come in like 1 or 1 ½ week, but it took almost the full 3 weeks. I also noticed that one of my boxes (I made 2 orders) was bent up upon arrival, but it’s impossible to tell where the damage might’ve occurred. 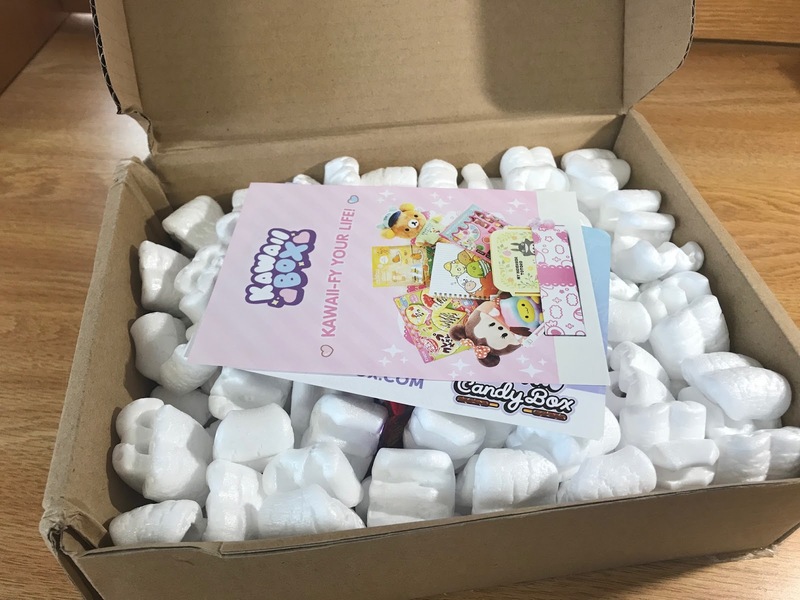 Each box contained Styrofoam packing peanuts to protect the items, and included a few coupon codes for Kawaii Box and Japan Candy box. I’m not sure if I will use the codes yet or not. I think this shop is definitely good for fair prices, especially if you shop sales. I bought every item listed here off the sale section, and I bought 9 items. It cost me just under $11. (plus I got free shipping and a free candy gift.) I think most of the prices in the sale section are plenty fair. You just have to know how to find a good deal. You can always check reviews as well to see what people thought of the item before you order it. Blippo has a wide variety of items to shop from and they add new items regularly. My only problem is that the sale section doesn’t get update very often so if you’re like me and pretty much exclusively shop sales, you’ll have to wait a while if you want new items to be added. My best advice is that if you want to shop from Blippo regularly, (like if you are buying stationary or charms that you like to stock up on,) make one big order per month and then wait until the next month to look in sales again. I think Blippo is a great place to find kawaii items if you’re on a budget, especially if you shop sales. 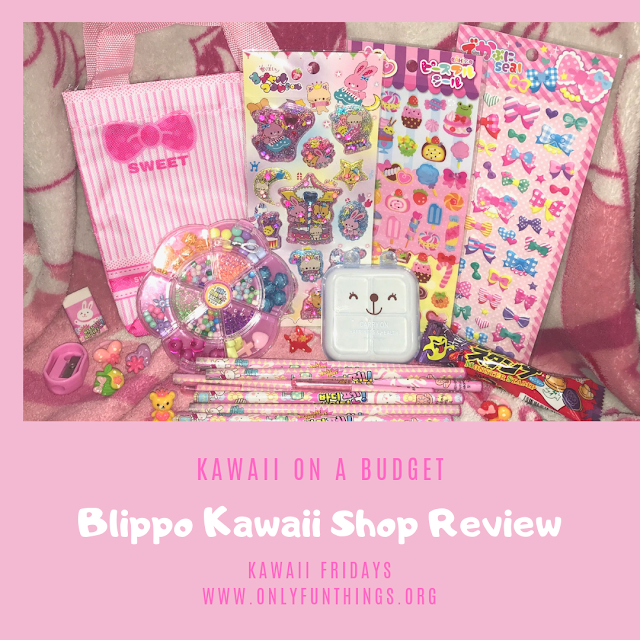 If you’re looking for a gift for a kawaii lover, or just want to treat yourself, Blippo seems like a great option to me! My only complaints are: how long free shipping takes (see above), and the quality of some items. But overall I would rate Blippo Kawaii Shop 4/5! Happy Kawaii Friday! Would you like to see more Kawaii on a Budget posts from us? Let me know in the comments!